Gold is one of those minerals that men have fought over. Its value in some people�s eyes is worth killing for. It certainly has great beauty, it is rare, and reacts with very few things so it does not corrode or wear away. But apart from its beauty, it has limited practical use. Gold is a natural element, easy to melt and very malleable (beats into thin sheets well). It has often been used as a monetary reserve by governments of different countries. Because it reacts with so few things, it is commonly found eroded out of the original rock and deposited in sedimentary beds. Its great value means that even solid rock, which contains less than 25 grams of gold per ton of rock will even be worked to extract it. Gold can sometimes be found in cubic crystals, which are usually kept for sale to collectors rather than melted down. Its first recorded reference is in Chapter Two of the Book of Genesis which states that it was found in the area where the one of the rivers from Eden flowed out. The river Pison went around the edge of the land of Havilah where there is �good gold�. In ancient Egypt it was not used as coins, but weighed out in the form of rings, which served the same purpose. 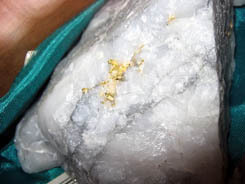 The gold specimen shown is from the Tasmanian gold mine at Beaconsfield, north of Launceston. It is a quality specimen of gold in a vein of quartz. This is the usual way in which gold is found in rock. Click here to email us a request to purchase this image.